This one dish wonder will feed an army. It's quick to put together and freezes well. Great to make ahead keep in the freezer for those hectic nights! Cook hamburger in skillet until no longer pink. Drain excess fat and stir in frozen vegetables and condensed soup. Stir in garlic powder, salt and pepper. Spray a large casserole dish or a 13 x 9 inch pan with cooking spray and pour in the beef mixture. 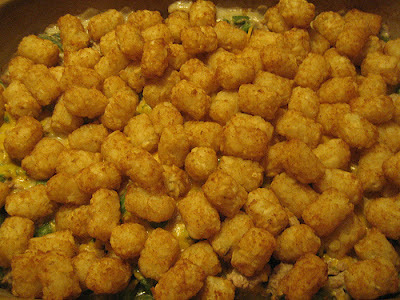 Sprinkle 1/2 the cheese over the beef then layer tater tots evenly over the top. Finish by putting the remaining cheese over the top of the tater tots. If freezing, cover with foil and freeze. If baking, place into preheated 350 degree oven for 20 - 25 minutes or until tots are crispy and cheese is bubbly!